Each author featured in the book has nominated a cat rescue and was assigned a month to promote the book, with a third of the profits from that month going to their rescue. 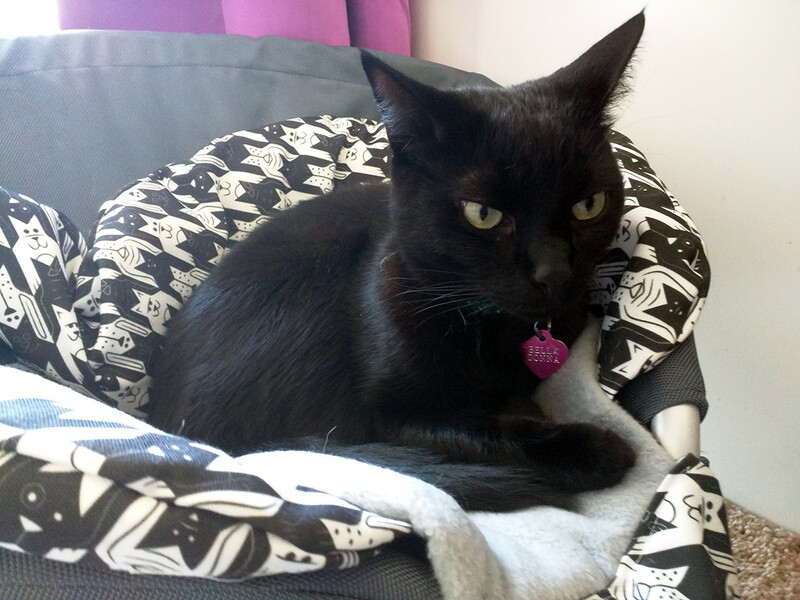 July's spotlight is Belladonna, one third of the feline team behind the popular Paws and Effect cat blog. Sweet Bella was just a baby when she was diagnosed with feline diabetes and found herself in the unenviable position of being a special needs cat looking for her forever home. She scored a wonderful one with a cat blogger eager to use her platform to spread the word about living with a sugar kitty! Welcome Belladonna! Thank you so much for taking time to chat with me today. Could you start by introducing yourself to us and telling us what made your story such a good fit for the Rescued anthology? Thank you! It's a pleasure to be here. Hmm, well, I am a very special kitty (and humble, too), so I think that's part of what made my story such a good fit. But mostly I think it was because ultimately my story was one of healing for me, and for Mama and my kitty siblings, too. You see, before she met me, Mama had lost two cats within six months--one to cancer, and one due to one of those one-in-a-million surgical complications--and she was very depressed and broken-hearted when I met her. But thanks to me, she was able to come out of her despair and find the courage to make a cross-country move! As the title of your story says, you're a "sweet sugar kitty", diagnosed with feline diabetes at a very young age and subsequently relinquished by your first family. That must have been such a frightening time for you. What do you remember about it? It was scary, just because I wasn't sure what was going to happen. And I felt bad for First Mama (as I call her) because I know she loved me but she just wasn't able to take care of a cat with diabetes. I don't have any hard feelings toward her. She was very good to me, and she did a lot more than most people would have. Mostly what I remember is being in a cage in a room full of barking dogs, and that wasn't much fun. But the vet was good to me, too--she even said she loved me and gave me little petties between seeing patients! My Mommy took care of a sugar kitty herself for a few years, and she says that looking after a special needs cat created a bond like she had never experienced before. Is that how it is for you and your Mama too? I'm not the first special-needs cat Mama's ever lived with, nor will I be the last. And I think you're right--it does create an amazing bond between person and kitty when there are challenges you have to meet together. I don't know if you know about my kitty sister, Tara. She was so scared when she came into our family that she hid under the couch for six whole months! But thanks to Mama's patience (and of course, thanks to my repeated offers to be her friend), Tara has been enjoying life with the rest of us for a while now! It sure is fun. I like to chase her, and now she chases me back, too, so that's super-fun! Um, what was I saying? Oh yeah, the bond between special-needs cats and people. I definitely feel super-close to Mama, not just because she adopted me but because of the work we do together to keep me healthy. You've inspired your Mama (an amazing cat blogger, we might add!) to use her platform to educate people about living with feline diabetes. How is your partnership helping other cats in need? Mama says "thanks for the compliment!" She and I have really enjoyed helping other caretakers of diabetic cats to understand the disease, and helping other diabetic kitties find homes, too. For a while, we were running a feature called Sugar Kitty Wednesday, where we shared stories about my fellow diabetic kitties at HART of Maine (that's the place where Mama adopted me from, by the way). A lot of them found their forever homes, and I like to think that it was due at least in part to the fact that we shared their stories! Mama also served on the board of directors of Diabetic Cats In Need, the organization that helped save my life and get Mama started with the supplies she needed to test my blood glucose and keep me healthy, for a couple of years. We've been sharing the word about DCIN and hopefully helping them raise some funds to help other sugar kitties. Oh my Bast, I don't think I could ask for a better life! 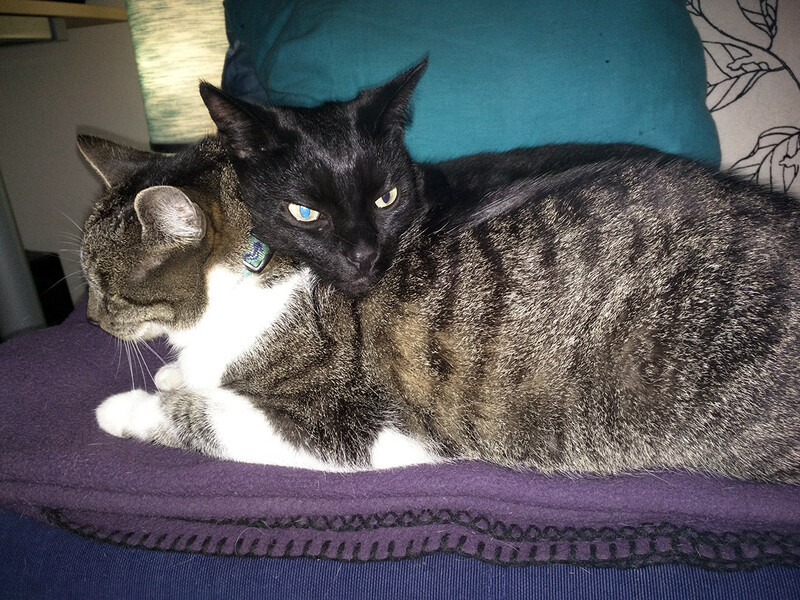 I've got an awesome snuggle buddy--my cat friend Thomas--and a kitty sister, Tara, who likes to play tag with me...what do you mean, you don't like playing tag with me, Tara? Anyway! Not only that, but I get to help Thomas and Tara write our blog, Paws and Effect, and I get lots of petties every day. Oh, and I almost forgot to mention, I've been in remission from diabetes for four years now! That means I don't have to get any insulin shots! Mama and I are both really happy about that. What shelter have you chosen to receive your proceeds from the book this month and why? The group I chose is Diabetic Cats In Need. They don't operate a shelter, but they help people all over the United States and Canada to be able to keep their sugar kitties and pay for medical expenses (diabetic crises are really expensive). DCIIN also helps to arrange transport for diabetic kitties who find themselves without homes, and educates people on how to care for their diabetic cats. I chose DCIN because, like I said earlier, they helped to save my life by making it possible for HART of Maine to care for sugar kitties, and I think all diabetic cats deserve to have a happy forever home like I do! What do you hope people learn from your story and what would you like your lasting legacy to be? I want people to know that diabetes isn't a death sentence. A diabetic cat can live a happy and healthy life with the right care--and, in fact, could even go into remission. If I've helped even one person to feel less overwhelmed by finding out their cat has diabetes, I'll feel like I've done my job. In the bigger picture, though, I just hope people will think about adopting special-needs cats, knowing through my story that even a cat with a serious disease like diabetes can provide many years of love and purrs. This was a great interview, Mudpie! We love Bella, and she has a great story. I can tell you that one of the reasons my human chose her for the book is because she wanted to help spread a good message about diabetic kitties. Oh, Belladonna, you sure did find yourself a purrfect mom in a purrfect furever home. Sugar kitties like you deserve lots and lots of love and respect, just like any kitty, and we are so happy you found that! 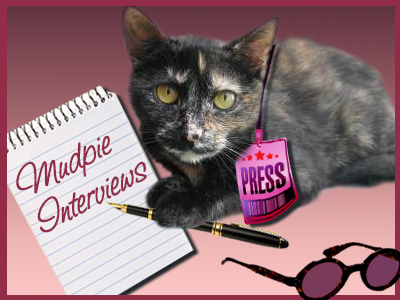 What a purrfect interview this is, Mudpie and Belladonna! Thanks for interviewing Belladonna, Mudpie. We can't wait to read her story in Rescued 2. We don't know what the mom is waiting for...why isn't she reading it now?? I'm glad Bella found a forever home (and a forever friend in Tara). The Island Cats's comment is exactly what I was gonna say! Excellent interview, Mudpie! I had one diabetic cat and it was stressful - but also well worth it. I'm so glad Belladonna finally gets her happily ever after. I just ordered Rescued 2 the other day, I look forward to reading Belladonna's story and the other 11.